With the holidays upon us (HOW DID THAT HAPPEN??? ), we know that the next six weeks will be anything but peaceful. How better to reward yourself than stocking up on some holiday HEAs, all listed here for those easy one-clicks. One lucky winner will receive 10 books--one from each of the participating authors PLUS a $25 Amazon gift certificate. To enter, go to: http://www.rafflecopter.com/rafl/display/c00761f51/? 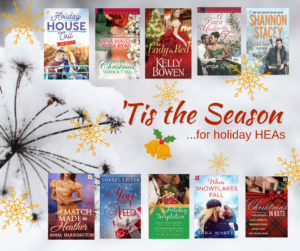 And in the meantime, you can shop for ALL of these novellas right here on this page. We hope you enjoy them--and happy holidays! Tara Wyatt'sWhen Snowflakes Fall: Amazon ~ B&N ~ iBooks ~ Kobo ~ Google Play ~ BAM!